Shopping Locally for Christmas: Plateau, Montréal. Shopping local can mean two things: shopping from locally owned businesses and shopping for things made locally. Ideally, both. For this season I decided to try to do this for all my Christmas shopping. I live in Montreal in an area called Plateau Mont-Royal and both the city and the borough are known for their artists and artisans, so perhaps this is not such a challenge. La Bobineuse de Laine. A Plateau institution that has existed in various locations and incarnations for over 60 years. This store is a mecca for anyone with the knitting bug as they specialize in yarn – Bobineuse de Laine literally means wool winder. Its current owner has taken the store to a new level of community presence and commitment by broadening the inventory to include things like macramé twine and giant wool roving; opening up the store to local artisans (including yours truly) and their products; offering lots of workshops and participating in fairs and events. They also have an online store. This year I purchased (who’s getting it is a secret…) a skein of naturally hand-dyed yarn by Bleu Poussière. Such a perfect trinity of local-ness, with the wool being a Québec Dorset. Beautiful! Les Petits Monstres. A children’s clothing store owned and operated by the delightful Galina, who aimed right from the very beginning to fill the store with locally handcrafted products. Here you will find everything from hand-made cloth bibs to toques and baby safe soaps and cosmetics. Les Petits Monstres currently carries five of my baby safe products. This store is soon closing however, so if you want to take advantage of some amazing 50% off deals, hurry! The store closes on December 22, 2017. La Grande Ourse. This store is owned and operated a gentle grande dame and retired Rudolf Steiner teacher. Although most of their finished products are imported from Europe, they also carry toys and items made locally, as well as materials to make your own Waldorf inspired crafts with. As the owner herself once told me: “there is one thing in this store you can steal: ideas.” If you would like to read about something I have made with their craft supplies click here. Boulangerie Les Co’Pains d’abord. With three locations in the Plateau, this is the perfect place to get some tasty stocking stuffers, hostess gifts, or even your Christmas bûche (order early!). Anyone who wishes to argue with me, ask me what I mailed across the ocean to my mother last Christmas (answer: their fruitcake). This is also a great place to stop at during your Christmas shopping and take a load off. Recommended favourites: the chocolate truffles, tarte choco-amande framboises (I have one of these EVERY week! ), and the hot chocolate, which is particularly good with a croissant or a palmier, each a little masterpiece of crunch, flake and buttery goodness. La Maison des Bières. If you happen to know a beer enthusiast, or be one yourself, this is the place to go. They not only carry an extensive inventory of locally made beers, but a wide variety of small batch artisan brews to suit every taste. They have a great selection of stouts and dark beers, which are great for making dark rye breads, and other Christmas type breads. Pictured below: Oat Stout soap (made with an oat stout from Québec brewers Microbrasserie du Lièvre), and the prop beer which I will be using to make my next beer soap with: Mille Iles Oat Stout. Both equally delicious by the way. Rose Café Montréal. This is another operation that looks to support local artisans and the local crafting community, by providing a meeting space, a retail section as well as venue for various events and workshops. Some of the products sold here are by artisan-entrepreneurs and some local hobby crafters who sew or crochet at home on their spare time. This year I bought two things from some of these crafty local ladies: a fabric case (perfect for pens, makeup or knitting and crochet needles) and a set of croched necklace and bracelet, appropriately, rose colored! 100% Cotton rope sold by macramé artisan Boho Montréal . She explained to me that she imports this rope from another Canadian maker. Ceramic Bowl by Élise Rubin: she is at Salon des Métiers d’art, until December 17 and well worth a visit. From Rudolf Steiner’s Christmas market. All natural artisan soap by Blue Moose Soap. I might as well admit, that this is a gift to myself. Stuffed animal in the shape of a Dalahäst for my toddler, by the mother and daughter team Almonte-Bravo. Knitted sheep’s wool toque for children. This hat is seriously soft, wellmade and even has a liner along the brim (I will try and find the maker of this hat and will edit it in). Flora & Pomona at La Bobineuse! La Bobineuse is located in the Plateau neighbourhood in Montreal. This store has been in the area for nearly half a century, a mecca for fiber enthusiasts, knitting addicts and beginners alike. They also offer classes on how to knit and crochet (which I plan to take as soon as possible). I spent lots of time in this cozy store last winter – buying skeins of beautiful turquoise merino, luscious baby alpaca and sheep’s wool (yes, I can’t even knit) – so I’m very happy and proud to see my Wool Wash and felted soaps on their shelves. La Bobineuse is located at 2196 Avenue du Mont Royal East, Montreal, QC H2H 1K3. Antique teacup aromatherapy candles are a beautiful way to enjoy the benefits of essential oils, especially now that the colder months are upon us. Right now I have three different aromatherapy blends – Calm, Happy and Relax – in three different cups: a dark rose pattern, a dusty pink rose pattern and a blue flowers and vines pattern. These all-natural soy candles are made with 100% EcoSoy, a wax made from non-GMO soy and a cleaner alternative to paraffin. Most commercially available candles are still made with paraffin wax, derived from petroleum oil, which releases the carcinogens benzene and toluene when burned. As an added bonus soywax is also biodegradable, non-staining and easy to remove! The wicks are made of 100% cotton and also primed in soywax. To the wax I add my own blend of pure essential oils and then this is poured into an antique tea cup and left to set. I select teacups that are made with fine china, have distinct features that I enjoy, like gold rims or interesting handles and that have a feeling of history to them. Some have matching plates and some I have matched with plates from other sets. In the end each candle is unique. While it is cute to set a candle on a plate it also serves a function to catch possible spills and make it easier to transport a lit candle with hot wax in it. 1. This is a woods blend I call Relax. It is a blend of Siberian pine, cedar wood and ho wood. Ho wood is an ecological alternative to rose wood which is now a restricted and endangered species. Pine, cedar and ho wood all have stress reducing properties, and this blend is designed to reduce nervous stress especially. If you can’t take a walk in the woods, this candle will give you a little “forest bath” in the comfort of your own home. Aromatherapy Candle in an Antique Teacup: a rosy blend of palmarosa, ho wood and rose creates a calming atmosphere. A. A citrus blend called Joy made of lemon, grapefruit, lemongrass and bergamot essential oils. Research shows that the smell of citrus can lessen stress and makes people feel happy. Remember that perfume from the 90’s, Happy? It is mostly citrus. The smell of citrus can lift your mood, brighten your day, and take the edge off frayed nerves. So a citrus candle might just be what the doctor ordered for those long dark and cold winter months: brightening in both senses. Aromatherapy Candle in an Antique Teacup: a blend of citrus essential oils to brighten smiles and lift frowns. One of the greatest things about the Waldorf store Grande Ourse, jouets pour la vie is that they sell the supplies to make textile toys similar to the ones they carry in store: things like real wool felt sheets, felting wool, thread, needles, and these beautiful embroidery scissors that I still haven’t bought but that I want. Badly. And the prices are affordable. I had bought a bunch of felt sheets with the idea to make a nursery mobile in the Waldorf style but had yet to start this project. While still in the googling stage – looking for ideas on how to theme my mobile – I had come across a bunch of pictures of felt plushies. They looked really easy to make. Some of them anyway. And being Scandinavian (and born in the 70s) I decided to wanted to make my version of a Scandi Cat, a ridiculously retro looking and cute plush toy made by a British lady (!). I would have to make my own pattern of course, but this wouldn’t be difficult because the Scandi Cat is basically just an oval topped with two triangles. I sketched him out on some paper then folded it in half to make sure that both sides were the same shape and that the ears were aligned. You can see the lines I drew with a liner – doing this is a good idea to make sure you line up the features. Made my own pattern by sketching out the cat on regular paper, after tracing the body, I cut the face out, after tracing the face, I cut the features out. I would have to sew on the features. Again, no biggie, because the Scandi cat, and almost all plush toys are cartoony with simplified features. After using the pattern to get the front and back part of the cat (you can see this in the pic above) I cut the features out of the pattern: the face, the nose and eyes and used these smaller parts as mini patterns. Here below you can see the cut out features. First you sew on the smaller parts onto the face using the blanket stitch. This is the same stitch I used to sew the cat together because it prevents the stuffing from coming out. It’s really simple and there are a ton of videos on how to blanket stitch. The only parts that are not blanket stitched are the pupils and the smile – those were back stitched – basically a straight stitch that starts where the last one ends. I didn’t even know it was called back stitch, it’s so simple you can figure it out just by trying to sew an uninterrupted line. Incidentally, I also pulled each subsequent stitch up through the last and found that this made a neater line without spaces, especially since I was sewing curbed lines. Here’s a bigger pic. Imagine that when you come back up with your needle instead of pulling it up next to your last stitch you pull it up into the very last millimeter of your previous stitch, essentially piercing through the thread and splitting the fibers of the thread a bit.But that’s nitpicking. It’ll probably be chewed to bits anyways, right? Ok, then when you have sewed the features on you sew the whole face on, as you see above, with the blanket stitch. Then you have your front completed and unless you want to put a tail on the back part, sew the front and back together with the blanket stitch: and leave a hole at the bottom and begin stuffing. Don’t cut your thread yet though! Just leave it hanging. I chose to stuff with wool. 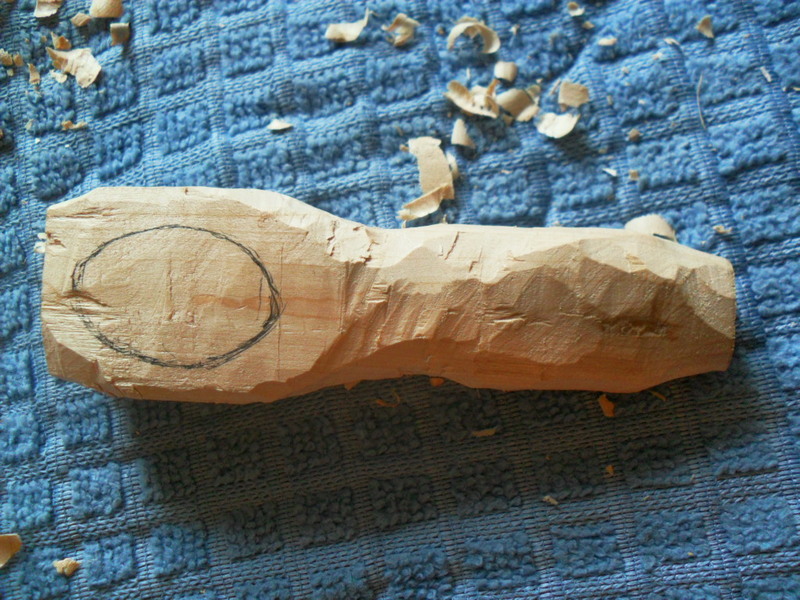 Using a wooden dowel, I stuffed the face first, getting the ears good and puffy and then continuing my way down. In the middle I inserted a brass bell. You see them tied around the necks of the golden easter bunnies in stores now actually. You can get them at craft stores too. I was told that to make it chime I would have to encase the bell in a hollow ball first because the wool would damped the bell. But no, it does not and a year later still sounds clear! So, I just wrapped wool around the bell loosely, then put it in the middle and stuffed wool all around it. I made sure not to stuff it too much though, because in order for baby to be able to grab it the toy needs to be soft and have some give. The same goes for when you get to the end: it’s easier to sew it up if you don’t stuff the bottom too much, so after stuffing the cat I sewed up the hole a bit more, then stuffed the bottom with the dowel and then stitched it shut. Ok, so I forgot (e.i. was too lazy) to give this cat whiskers and a tail. But, he’s a unique fellow. Kinda looks like the Cheshire cat, don’t you think? Like all the baby crafts I made while pregnant, I was worried that my baby wouldn’t like it. But she loves “katten” (cat in Swedish), especially the ears which she have chewed and sucked into little dark points. Here he is one year later, a bit mussed up, but loved. Thanks for stopping by 🙂 Next time: how I made a felt and wood Sun, Moon and Stars Mobile! This time last year I was pregnant with my first baby. I wasn’t working and since it was winter – and it was a brutal winter – I spent most of my time indoors, watching youtube videos on how to cloth diaper, and reading babycenter.com threads on morning sickness. I watched the blowing snow bend the two pines in the backyard. A peregrine falcon visited us a couple of times – eating his fresh caught prey on the pine branches. It was too soon to set up the crib. I wanted to paint, but had to wait until we could open the windows. There wasn’t really much I could do. I had started to visit a Waldorf store on Duluth street called “Grande Ourse: jouets pour la vie” meaning, toys for life. I love the toys in that store but I couldn’t really afford most of them. One day I picked up a piece of wood I had found on the mountain (In Montreal we are blessed to have a forested mountain in the middle of our city) and I started to whittle. This was the first baby item I made myself. It became a teething spoon. The two days it took to make it went really fast and as soon as it was done I thought: what else can I make? Here is a series on how I spent last winter, crafting baby items for my growing bump. Hope you like it! Peregrine Falcon visiting us in a snow storm. So, I found a piece of wood on the mountain. I think it’s probably maple, because the mountain (well, all of Montreal, and Quebec) is covered in maple. I’m a gatherer by nature so I have a lot of odds and ends around, and this time it proved really useful. As a small baby myself, I bit up a whole wooden dining room table so I knew teething toys might come handy. I watched a couple of videos on whittling and got busy. 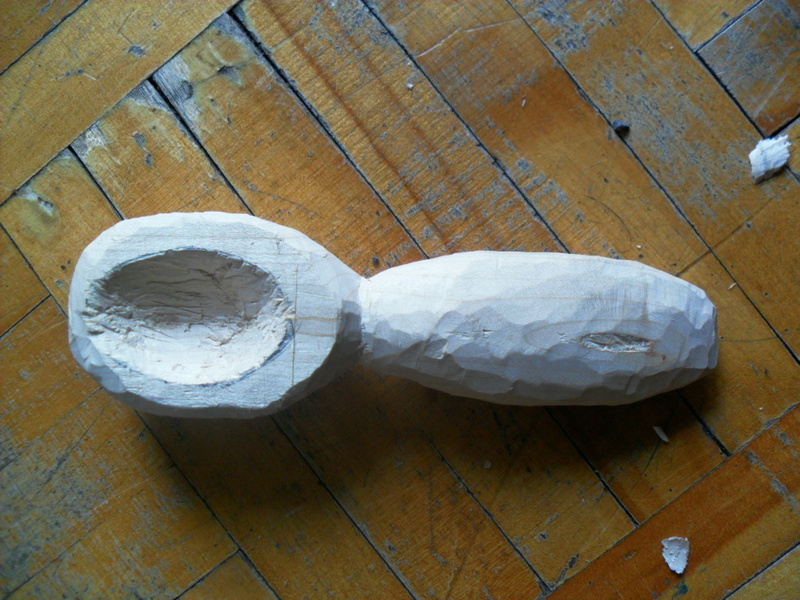 The first thing I did was saw off a manageable piece, about the length I wanted the spoon to be. I was lucky enough that the stick was already split in half. If it hadn’t been I would have had to split it by hammering in a knife point down the middle, if that makes sense. Next I roughly sketched the spoon out with a pen and “sketched” the outlines with a Swiss army knife. After that, I whittled away, making sure to whittle the handle away from the bowl of the spoon so that I wouldn’t slip and take away part of the bowl. I didn’t have proper spoon carving tools, but I did have a small whittle knife with a v-shaped blade and I used that to dig out the bowl. Sometimes I would stick the blade of the Swiss Army knife down the sides, but other than that a knife is pretty useless when you’re carving a bowl. Starting to look like something! 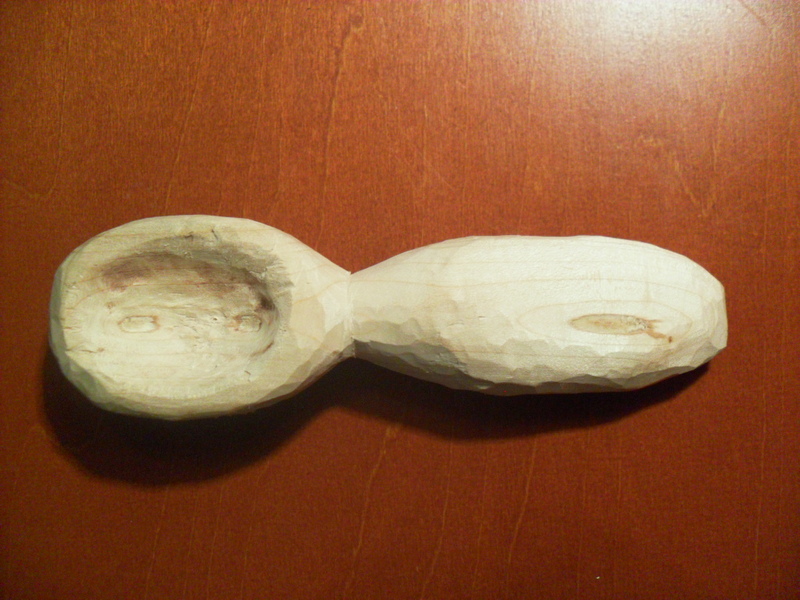 After this I started sanding the spoon with coarse grit sandpaper, slimming it down and getting more elegant lines. Then, a finer grit sandpaper…and voila! A teething spoon! I finished it all off with a baby safe wood-finish I made myself, using beeswax, linseed oil (boiled flax seed oil) and olive oil. This kind of coating is often used on wooden Waldorf toys btw. Making baby-safe wood finish with linseed oil, beeswax and olive oil. 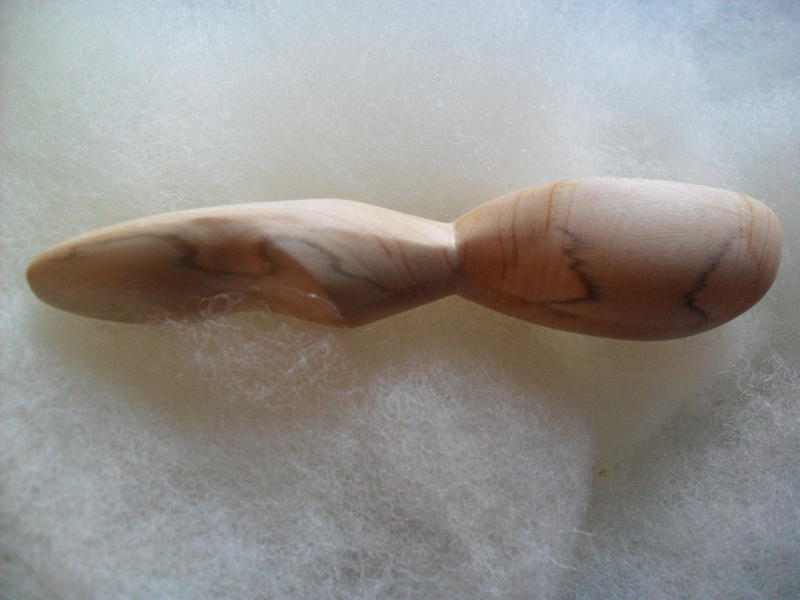 Finishing my teething spoon gives it that sleek look and protects the wood! Side view, showing the grain of the wood. 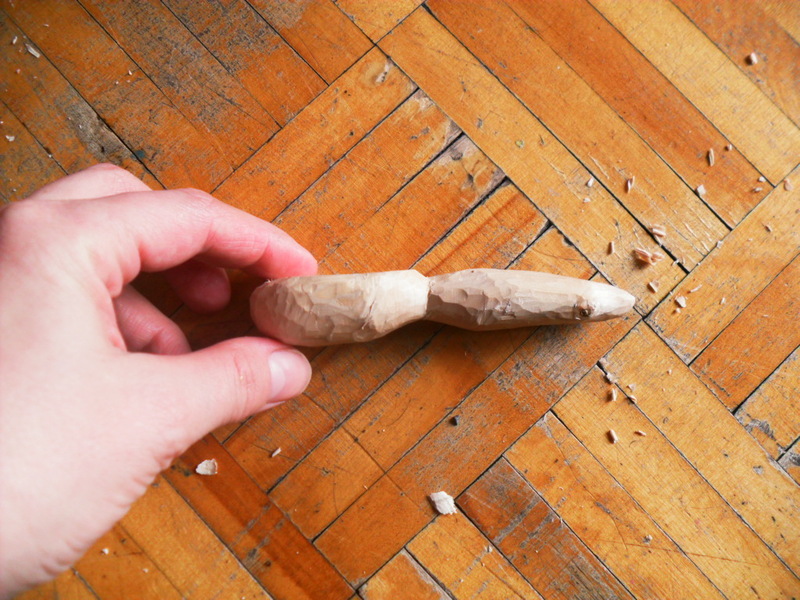 Whittling proved pretty fun, if tiring on the fingers. And messy! Especially if you don’t have the proper tools. But I was happy to find out that you can make cool things with so little: a Swiss army knife, some Dollarstore sandpaper and a couple small wood working tools I got in Chinatown for under 5$. It kept me busy for a few days, then I had to find something else to do! Next part: how I made a felt cat rattle!